If you woke up today and are reading this then there’s a good chance that something happened OR will happen that you didn’t see coming. Your car breaks down, you trip on the stairs and twist your ankle, your computer crashes, your child is sick, you didn’t get the promotion, etc…The point is “LIFE” is going to happen, the stress of those situations is going to come crashing in and you have two options in how you respond and how you let it affect you and your health. Forty-three percent of all adults suffer adverse health effects from stress. Seventy-five percent to 90% of all doctor’s office visits are for stress-related ailments and complaints. Stress can play a part in problems such as headaches, high blood pressure, heart problems, diabetes, skin conditions, asthma, arthritis, depression, and anxiety. The Occupational Safety and Health Administration (OSHA) declared stress a hazard of the workplace. Stress costs American industry more than $300 billion annually. The lifetime prevalence of an emotional disorder is more than 50%, often due to chronic, untreated stress reactions. Before I got serious about my health I was experiencing each of these to some extent. When I encountered stress my immediate reaction was – FOOD. Even today, as in just a few hours ago of writing this blog post, I faced a big serving of stress and I immediately felt the desire to go hunting for something to eat. Stress definitely has it’s roots in the mind and there are a number of mental tools to deal with that side of stress. But, one thing I have found that help keep stress in it’s place is the dreaded E-word; EXERCISE. And yes, I get it and have been there – nobody wants to talk about it or do it but if you are going to conquer stress it’s going to take work. There will be a level of discomfort involved. My personal experience with exercise and the positive impact it has had on my ability to deal with stress has been incredible. Over the last eighteen months I have experienced a physical change in my brain, no just my mind and emotions. If I miss working out for more than two days I start to feel the effects in my brain. I will begin to feel slower in my ability to process things and will lose my mental edge. Biologically, exercise seems to give the body a chance to practice dealing with stress. It forces the body’s physiological systems — all of which are involved in the stress response — to communicate much more closely than usual: The cardiovascular system communicates with the renal system, which communicates with the muscular system. And all of these are controlled by the central and sympathetic nervous systems, which also must communicate with each other. This workout of the body’s communication system may be the true value of exercise; the more sedentary we get, the less efficient our bodies in responding to stress. I love challenges. Over the past three years I’ve competed in several different health challenges. Even as I’m writing this post I am finishing a year long challenge sponsored by 1st Phorm supplements called My Transphormation Starts Today. But I love the competition and being in the trenches with a group of other people pushing towards a shared goal. Through my challenges I have learned a number of things. First, I’ve learned NOT to set unrealistic goals. If you haven’t exercised in quite a while don’t expect to run three miles within ten minutes your first time out. Don’t expect to lift like Arnold your first time slinging the barbells. Set your expectations high enough that you are going to need to sweat and work hard, but not high enough that you become discouraged fifteen minutes into your first workout. Second, you need to be consistent. I started exercising three times a week and doing 30 minutes on the elliptical machine. Over the course of the first six months I worked up to three times a week at sixty minutes per session. But, by the end of my first year I was hitting the gym five times a week and doing a variety of cardio and core exercises. During the second and third year of my health journ ey I began to lift weights in addition to my cardio. But the key was staying consistent and committed to working out. Third, trust the process. Eric Thomas says you have to fall in love with the process. 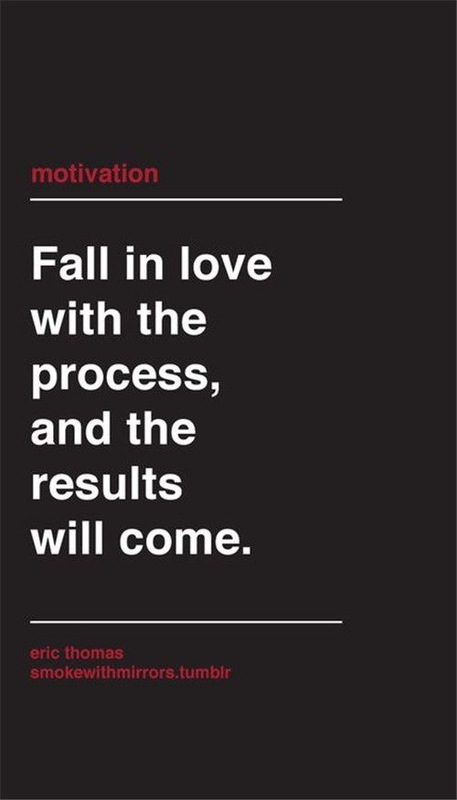 And when you fall in love with the process the results will come. You have to take a long term outlook with your health. If you are looking for a quick fix and not a lifelong change then give it up now. You will need patience and when things are tough and you aren’t seeing a lot of change you will have to trust the process and know that your persistence will bring the results. Life is always going to happen but in the midst of it you have to stay committed to your goals, remain consistent and trust the process. Don’t give into the temptation of justifying poor choices just because “life happens”. Push back against “life” and run towards the prize of a healthy and productive life. This post is part of the Last 100 Days of 2016 Series. As of today there are 81 days left in 2016, what will you do with them? 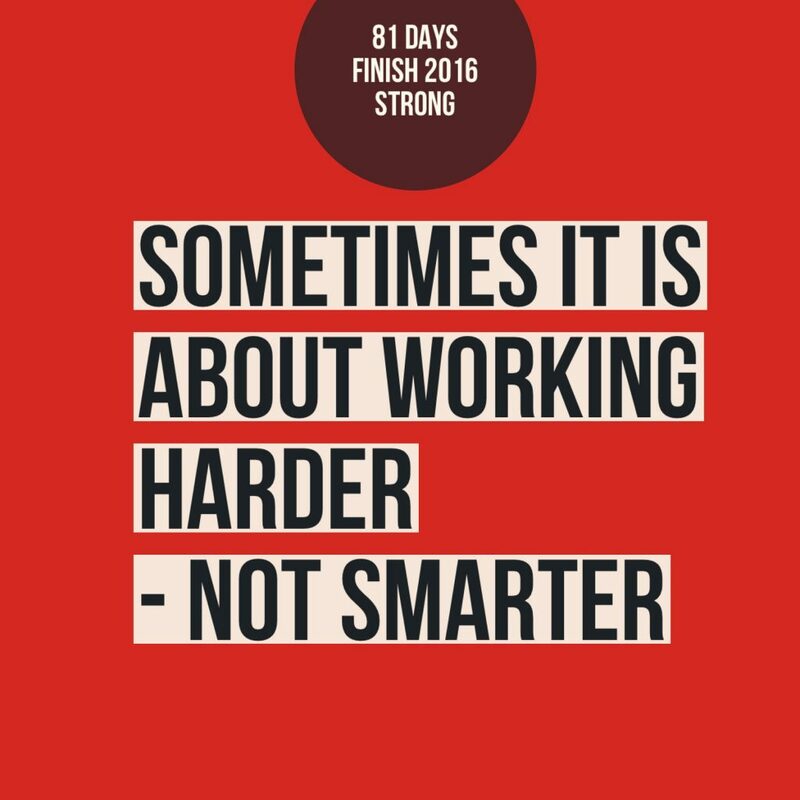 We have all heard the statement “work smarter, not harder”. And while that’s a true statement it doesn’t AND can’t replace the fact that sometimes you need to work harder. Sometimes it means getting up earlier or staying up later. Sometimes, actually most of the time, it requires you to sacrifice and do things that are uncomfortable and take you out of your comfort zone. Here are 10 quotes that will motivate you to work harder and not just smarter. Don’t get me wrong, there are definitely times where you need to learn more and become smarter. But, don’t fall into the trap of feeling you haven’t learned enough and become smart enough to get the work done. Sometimes you just need to take the first step, do what you know to do and when you don’t know what to do next then learn and become smarter. You’ll never have everything figured out when you begin. And after you begin you’ll realize you know even less than you thought you did. The important thing is to get to work! This post is part of the Last 100 Days of 2016 Series. As of today there are 98 days left in 2016, what will do with them? If you wan to be part of the 8% you absolutely can. Overcoming is within your reach. 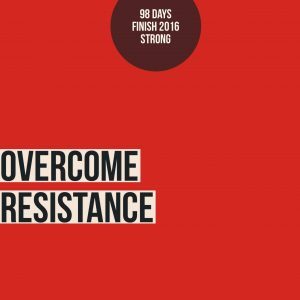 Here are three ways to push through resistance and make the change you desire. You don’t need to be Luke Skywalker or Master Yoda and possess Jedi powers to overcome the resistance but your mind plays a huge role. You either decide to give in to resistance and accept defeat or make the decision to push back, fight and conquer it. From the big to little decisions it all counts. The choices you make in the next hour, day, week or month will be reflected in your future. Choose wisely and with purpose. Research shows that people who explicitly make resolutions are 10 times more likely to attain their goals than people who don’t explicitly make resolutions. At the beginning of this year I chose three words that would define my approach to 2016. I wrote those words down in various places so that I’m always reminded of my focus and my goals. Being part of a community and having others that know the changes you are attempting to make is a big part of success or failure. When you have someone or many people that you know will ask you how things are going there’s an added level of commitment. At the beginning of this year I was part of a couple health challenges. In one challenge I was part of a team. Me and four others knew each other’s goals and were committed to helping each other. We would text, work out together, email and stay connected through social media. Our relationship had two main purposes in the beginning; 1) hold each accountable 2) encourage one another. Find at least one person who’s up in your business and see the kind of difference it can make. Don’t lose heart – keep fighting against whatever is resisting you, your goals and your progress. Are You Building The Future You Want To Live In?